A bike ride on the Isle of Palms is the perfect way to get outdoors and experience the island’s beautiful weather and scenic streets. Cruise along the coastal bike trails and neighborhood sidewalks while enjoying a nice breeze and stunning landscape. During your stay, you’ll have access to a few wonderful places offering Isle of Palms bike rentals. Visit one of the shops mentioned below to pick up a few bikes and explore South Carolina’s stunning coastal oasis! Along with Isle of Palms bike rentals, there are so many wonderful ways to explore the area! From golf courses and watersports to the best dining and shopping, you won’t be short on fascinating and memorable things to do on your vacation. For help planning the ultimate trip, be sure to request access to our free Vacation Guide. We’ve included our recommendations for the best activities and attractions in the area. In addition, you’ll find information on the top restaurants, shops, museums, historical sites, and more. The perfect Isle of Palms vacation awaits! Isle of Palms Beach Chair Company offers more than just beach chairs. They provide a selection of adult and youth bikes and accessories, along with stand-up paddle boards, surfboards, bodyboards, and more! If you’re bringing young ones along on your bike ride, you can choose the bike with a trailer or bike with a child seat. Additionally, they have baby jogger strollers, bicycle baskets, helmets, and two different sizes of youth bikes. The Beach Chair Company offers free delivery to Isle of Palms and Sullivan’s Island, making IOP beach rentals extremely convenient! Another great place to find bike rentals on the Isle of Palms, SC, is Carolina Bike and Beach. The family-owned business offers a selection of affordable bikes and free delivery right to your door. From aluminum-framed beach cruisers and adult bikes to kids bikes with training wheels and beach joggers, you’ll find everything at this shop! The Bicycle Shoppe in Mount Pleasant serves Isle of Palms, Wild Dunes, Sullivan’s Island, Kiawah, and Seabrook. They offer free delivery and pickup for all bikes. If you preorder with the Bicycle Shoppe, your bikes can be waiting for you at your vacation rental when you arrive! They also offer in-store pickup at both locations in downtown Charleston and Mount Pleasant. Complimentary baskets, locks, and helmets are included with every rental! There’s no better way to explore South Carolina’s barrier islands than with Isle of Palms bike rentals! You’ll love being outside and enjoying the Isle of Palms and Charleston area while leisurely cruising on your bike. If you’re looking for the perfect place to stay during your vacation, let our team at East Islands Rentals find you the perfect beach getaway. Along with spacious rooms, luxurious amenities, and easy beach access, your East Islands vacation rental will be within biking distance to everything on the island. One of our favorite homes available for summer rental is tucked away at 302 Ocean Boulevard. This fabulous oceanfront home features a private pool, million-dollar views, a state-of-the-art kitchen, large dining room seating up to 14, and so much more. With seven bedrooms and six and a half bathrooms, this is the perfect escape for a multi-family beach vacation! 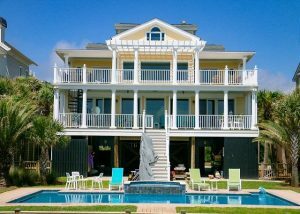 Check availability of all our vacation rentals today, and start planning the perfect Isle of Palms vacation!